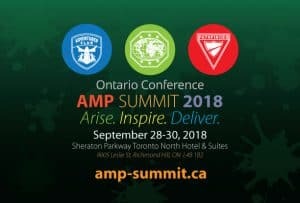 The AMP LEADERSHIP SUMMIT will be held on Sept. 28-30, 2018 at Sheraton Parkway Hotel & Suites (9005 Leslie St., Richmond Hill, ON) with the theme, “ARISE. INSPIRE. DELIVER.” Guest speaker: Elder Gary Blanchard, GC Youth Director. All Adventurer, Pathfinder, and Youth leaders, Master Guides, Teen Leadership Trainees (TLTs), Master Guide Trainees (MGTs), pastors, and interested church leaders, who are passionate about discipling children and youth are encouraged to register. Early bird registration (until April 30, 2018) = $125/person; regular registration (May 1-July 31, 2018) = $150/person. To register and for more info, visit www.amp-summit.ca .